After hearing from 95,000 Americans largely unhappy about a plan to kill wolves on Unimak Island, the U.S. Fish and Wildlife Service has abandoned an earlier recommendation that action be taken to try to limit predation on the Unimak Island caribou herd in Western Alaska. The agency announced in a press release Monday that is has decided "that the 'No Action' alternative is warranted at this time." The "No Action" alternative is good for wolves, which won't get shot, but not so good for caribou, which will get eaten by wolves. 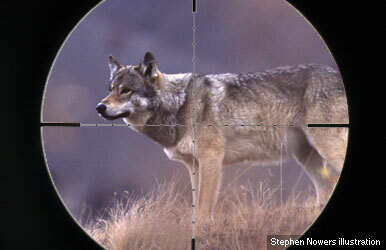 Fish and Wildlife said the science just doesn't support a wolf kill at this time. The Alaska Department of Fish and Game has lobbied for a wolf hunt, saying it is one of the few ways to increase the size of the caribou herd. The Fish and Wildlife Service doesn't disagree with that conclusion, but in its final decision ruled there is no crisis requiring a wolf kill. "While at the conclusion of the (environmental assessment) the Service was inclined to support (a wolf kill) on Unimak, further evaluation of refuge purposes leads us to believe that the No Action alternative represents the best balance among those mandates,'' the press release said. Fish and Wildlife is tasked with managing the Alaska Maritime National Wildlife Refuge, of which Unimak Island is part, for the conservation of natural diversity, preservation of wilderness, and maintenance of the subsistence lifestyle for the fewer than 50 people who live on the remote island. Wolf control would have provided more caribou for subsistence hunters, "but with impacts upon both the natural diversity and wilderness character of Unimak Island,'' the press release said. Environmentalists were quick to praise the decision to allow the wolves to continue to run wild. "We are thrilled the agency made the right decision,'' said Rebecca Noblin of the Center for Biological Diversity. Comment from the state of Alaska was not immediately available. The state last year sued to try to force the Fish and Wildlife Service to allow state gunners to begin shooting wolves on the island. At that time, it looked as though the population of caribou bulls on the island was shrinking so fast the caribou might not be able to successfully continue to reproduce, but the ratio of bulls to cows later improved slightly.